Cannes. Simply saying the word conjures up the color red, a gorgeous and vibrant crimson sparkling with glitterati and paparazzi. I'm talking about the red carpet at the Festival de Cannes, the nearly two-week long film festival where celebrities strike poses and poseurs try their best to become celebrities. Walking the red carpet at Cannes is more than an experience, it is one of the Bucket List Bests, falling in rank with The Met Gala, the Oscars and the Venice Film Festival, where everyone is looking at everyone else, or better yet - what they are wearing. Flattered by the invitation from San Pellegrino, I quickly thought "I've got this". Remember, in my past life living in Los Angeles, I talked the talk and walked the walk on few red carpets including from limited release films like Evelyn to blockbusters like Die Another Day. And in most of my walks, I took a nonchalant glam attitude since I had a bit of experience beingfront and slightly off-center as guest and personal assistant to an A+ actor. Of course, I thought I knew it all for my walk down Promenade de la Croisette. The Festival de Cannes is nothing like Hollywood. It's a busy French beach town when not festival season [vaguely reminiscent of Atlantic City], and when the Festival is on, well, it's an all day/ all night scene. My hotel JW Marriott was beach-front la Croisette, in other words, prime real estate for celebrity sightings. Upon arriving, I bumped into director Paolo Sorrentino and later Roman Polanski in the elevators. One night, I popped a few bottles of Franciacorta with Italian super chefs Gualtiero Marchesi, Carlo Cracco, Davide Oldani and Andrea Berton, and the next day, I literally felt into Robert Pattison when heading out of the hotel to lunch at Nespresso's sur la plage pop-up. Illustrator and beauty blogger Stephanie Rousseau brought me into the Chanel Suite at the historic Hotel Barrière for a little touch up, where we chatted with Ekaterina Samsonov, having no clue that we were about to see her on the big screen later that evening. I know you're thinking what I was thinking. What was I wearing? Thanks to San Pellegrino, I had not one but two struts down those famous red threads- Friday's intimate evening screening of The Great Italian, a one-hour long docu-film about Chef Marchesi, and then Saturday's closing screening for You Were Never Really Here directed by Lynne Ramsay, starring Joaquin Phoenix and Samsonov, later winner of Best Screenplay and Best Actor. I was nervous and had no idea, so I put myself in the hands and eye stylist Simona Scaloni of Nice To Dress You who picked out not one but two Le Petite Robe by Chiara Boni, a duo of fabulous, formfitting and distinct dresses- fun and frilly one-shoulder peach number, and elegant black column. Perfect. Even with Friday's screening as practice, a professional make up session and a gorgeous dress, I was not ready for Saturday's red carpet walk. Cannes streets were flooded with thousands of incredibly-dressed people who wanted to know who we were just as much as we did too. As we headed to the entry area, we were bombarded with faux paparazzi offering to take photos (at a price) and crazily-dressed Cannes fans asking for a ticket or two. Stephanie, I and fashion writer Sophie Fontanel entered the cordoned-off red carpet just as there was a surge - thousands of clicks and strobing flashing, and that's when I realized that I had absolutely no idea what was about to happen. Escorts nudged us forward as photographers stopped us and people pulled at us to see who were were. The entire walk probably took under three minutes but time stood still for at least two of them, especially that last minute when Joaquin Phoenix made his appearance and the carpet stopped. We flowed upstream to our balcony seats, and shortly upon Phoenix entered the theatre, driving the audience wild. The lights dimmed, a hush took over the hall and we knew the show was about to begin. But then again, it had already started. . .
Would I go back to the Festival de Cannes? Yes. But I'd wear more color, more flair, and bigger hair. If you're looking to top off your bucket list, a red carpet walk should be penciled in. Here's a black-and-white glimpse at a weekend in the red . . . If there is one plate that I would go to the ends of the earth for, it is carbonara- my kind of comfort food and Rome's emblematic dish of pasta, egg, grated pecorino (and/or parmesan) cheese, and guanciale. I will go out of my way, leaps and bounds for just a plate so over the years, I've made it my business to eat carbonara in every Roman restaurant I step foot in, an ongoing culinary quest for that very best until a fateful Saturday, September 21, 2013, when I sat down at Pipero and ate the last forkful of Luciano Monsilio's carbonara. The only word to describe his carbonara is perfection - aesthetically beautiful- a sunflower-colored knot of pasta in a serving that was neither too much nor too little with the ideal Italian umami thanks to Luciano's preternatural culinary skills for combining grated pecorino and parmesan cheese, pepper-spiced beaten egg yolk, and pan-cooked guanciale in just the perfect amounts, and Alessandro Pipero, owner of his epynymous restaurantknew it. Heck, he even made a film about it. As I walked out of Pipero, I vowed I would never eat carbonara again, unless Luciano was putting a plate of it in front of me or, and there always is an "or", it was vetted as hands-down amazing by a series of carbonara sycophants including Luca Sessa, Katie Parla, my favorite taxi driver Emanuele and my aunt Graziella. It was easy to hold back from my carbonara fix. Pipero was getting a lot of press after receiving a much-deserved Michelin star in November of 2012, which meant it was harder to just pop by, and personally I wasn't keen on its location at the Hotel Rex, andthough it is/was somewhat easy to find other great carbonara, my heart belonged to Pipero. Fast forward to March 2017 when, while casually strolling down Corso Vittorio Emanuele II, the thoroughfare linking St. Peter's to Piazza Venezia, I noticed that the old and vacant bank across from Chiesa Nuova had curtains. I took a closer look. Pipero's moved in. Real estate is tough negotiation for a Rome restaurant, and even tougher for a Michelin-starred joint. Choices are either hotel spaces, which is usually a compromise of interior design and multipurpose like a breakfast buffet, or a private space, sacrificing light for independence. The new Pipero is neither. Taking over a former bank in the Piazza Navona/Campo de' Fiori neighborhood, Pipero has location. And thanks to the architectural demands of said bank, Pipero has light- a luminous space of high ceilings, and full-length windows on two sides of the corner restaurant. A chic interior, the lounge/restaurant is simply accented with Poltrona Frau chairs, Flos lamps, original parquet floors and absolutely no clocks on the table, a detail Alessandro loved in Pipero's original incarnation but thankfully shelved in 2017. The ground level area has seven tables, with an open mezzanine hosting three tables, while the subterranean is home to Pipero's wine cellar - a cozy, private dining cave lined with labels hand-picked by Alessandro, who also happens to be a sommelier. Let's get serious. Style was the first thing on my mind. Before sitting down at Pipero's table, my most important concern was the food and whether or not Pipero would uphold or even surpass this crazy idolization I created over the years. Was it still perfect? On a Tuesday afternoon, I found out by treating myself to a six-course tasting menu. [Note: I asked to include the carbonara, as Alessandro and Luciano had removed it from the menu, making it available to guests by request.] The restaurant was quiet - just me, a couple, and Achille Sardiello, Alessandro's Numero Uno and maitre d', a man whose dedication to Pipero - owner, restaurant and dishes - is all about poise and professionalism. Achille charmingly commands the floor. The mythical carbonara appeared after an incredible duck tartar "panino" of crispy, slim bread with homemade mustard, and a rigatoni with broccoli, sausage and pecorino that playfully innovates tradition and changed my entire life view on broccoli. It would be an understatement to say I was sated when the carbonara arrived, but I needed to make sure Pipero was still Pipero. Every bite that afternoon was just as perfect as the first, second and third times I had eaten Luciano's magical carbonara. Mission accomplished,but to follow was a lambcut which blew my mind with its delicious combination of cottura perfetta (perfectly cooked), anchovies and a raspberry cream. I could've stopped there, gone home and written a love sonnet to Pipero, but why not make sure? One month later, I organized a private dinner for 30 for the very same six-course tasting menu. Of course, Alessandro, Luciano and Achille did not disappoint- perfect service, perfect ambience, perfect dishes -- and yep, that carbonara was perfect. This article originally appeared in Fathom on April 28, 2017. Highlights from the most recent Biennale. Photo by Erica Firpo. Every other spring, the contemporary art world flocks to Italy to celebrate art, dance, architecture, cinema, and theater at the Venice Biennale. Fathom contributing editor and Biennale regular Erica Firpo gives us a peek at what she's packing in her suitcase. VENICE – Flashback to the 1999 Venice Biennale, a time where I spent many months covered in red powder. Anne Hamilton, an artist representing at the U.S. Pavilion, made a crimson snowfall cascade down the walls for her installation Myein, and it was my job, as the Peggy Guggenheim Collection assistant, to make sure the powder and everything else flowed smoothly. There was nothing glamorous about the long hours, often spent alone, in a bone-chillingly cold pavilion, occasionally greeting guests and explaining the installation — but the full immersion into contemporary art was unforgettable, and every 24 months, I return to the Biennale for that very same pleasure, though now as a journalist covering the art. Over the decades, the press preview for the exhibition has evolved from a quiet industry event for artists, gallerists, and journalists to 72 solid hours of art and hobnobbing with the Pantheon of Glitterati — art, fashion, literature, and film folk from all over. As soon as I arrive in Venice, I have to be ready for nonstop exhibitions, openings, and cocktail parties. Style, efficiency, and fun are my goals — and the same can be said for anyone visiting the Biennale. My suitcase is a balanced mix of form and function, organized Matryoshka-style. Here's a peek inside. There are a lot of things I've never done, but there are a few things I kick myself for never doing. In all my travels to Milan, as frequent as once a month or as sparse as one as year, the one thing I 've never done that I kept saying I would ~ nope, it's not glamming it up for a photo shoot, late night dancing with Giorgio Armani, running in Parco Sempione, hanging out at the top of the Duomo, nor visiting Milan's underground, I've done them all ~ my one thing never done is visit the Cenacolo -Leonardo da Vinci's incredible and impossible Last Supper, a painting that has survived bombings and bad restorations, and whose humble 21st century request is that you book your visit in advance. And every time I come back from a visit to Milan, I feel guilty but obviously not enough to reserve my 15-minute slot. That is until two months ago. Backstory: December 2016 and I'm sipping wine at Colbert, a special cocktail event hosted by Mastercard for its Priceless Cities subscribers. The event and setting were lovely and piqued my curiosity as to what else Mastercard thought was Priceless in Italy. 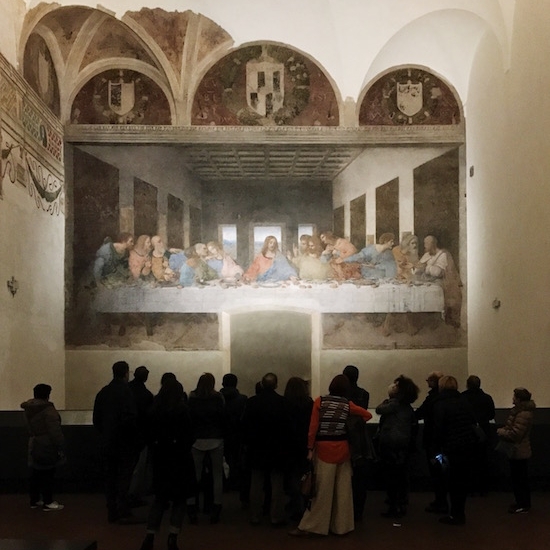 Scrolling through Priceless, I came across rooftop dinners, cooking courses, gala events, a historic walks, vabbè.... and there it was - the Last Supper, an hour-long visit to see Leonardo's fresco and walk through the adjacent Chiesa di Santa Maria della Grazie. 22 euro and no navigating through the Cenacolo's website, it was about time to get back to Milan. Pigrizia cenacolosa, Last Supper laziness, a close cousin of pigrizia sistiniana- living in Rome without having ever been to the Sistine Chapel. That's what I quickly learned when chatting up the 20 some PricelessCities guests who were waiting with me in Piazza di Santa Maria delle Grazie. All but one of them had never seen the Cenacolo, and most of them lived in Milan. No biggie, and I totally I get it, I thought as we lined up single file to enter a hermetically sealed waiting space before the big reveal. It's not always easy to visit the most important art historical site in your city, much less your country, especially when you live in the neighborhood. We stepped inside and the 15 minute countdown began. The room itself is plain, two frescos on both ends of what was once the convent's dining hall. The Last Supper is incredible.... large ( 29 feet long by 15 feet high) and incredibly detailed. I loved looking it at from the center of the room- the orthogonals pull you to the table, but the closest you can stand is about 8 feet away. For the first ten minutes, the base of the painting was crowded, everyone looking for Christ's feet and Mary Magdalene. Me too, but I didn't join the rest as they looked at the second, non-Lenardo fresco, so I enjoyed five minutes of the Last Supper all to myself. It blew my mind- the movement, the figures, the details. I started to wonder if the models were his friends, and if so, who? 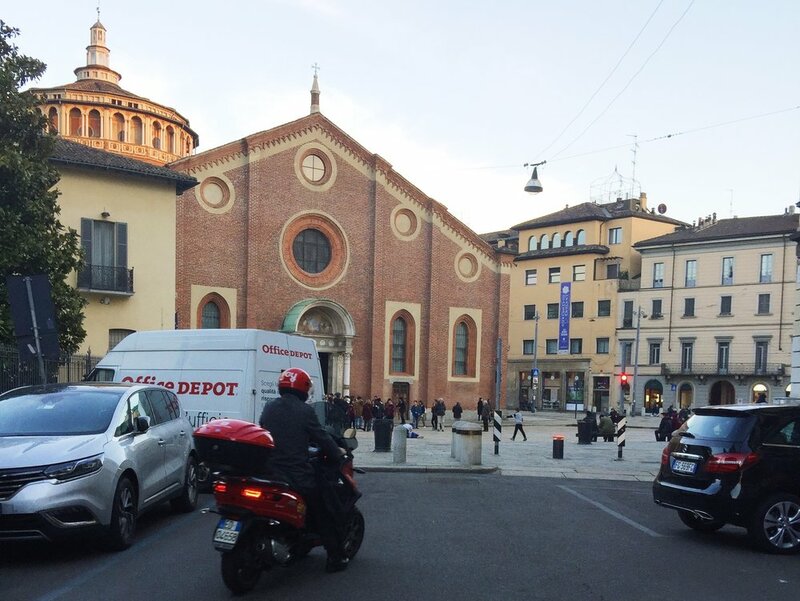 I walked out of the room kicking myself for not having been there before, every "before" that I've ever had in Milan, and headed to the Bramante-designed basilica and sacrestia, but I'll be honest, it was a beautiful blur since my mind was on the Last Supper. Yes, you must reserve your visit - and I think via Priceless Cities is the best way to do so. Once you sign up (free! ), all you have to do is reserve the event on the site, Priceless Cities takes. PS- rrom what I understand, any Priceless subscriber (in any city) can sign up for events in other cities, so no, you don't have to live in Italy. Yes, photos are permitted but without flash. And yes, those fifteen minutes (plus train ride) were worth it. 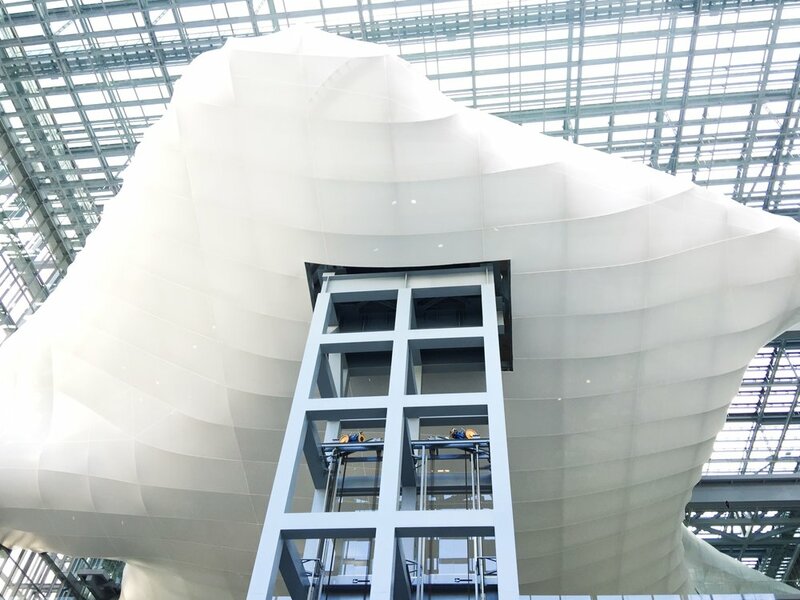 It's been ten years since I went to MAXXI to hear architecture Massimiliano Fuksas talk about his dreams of clouds, and just four years since I wrote about the "coming soon" opening of La Nuvola, Fuksas's architectonical actualization. 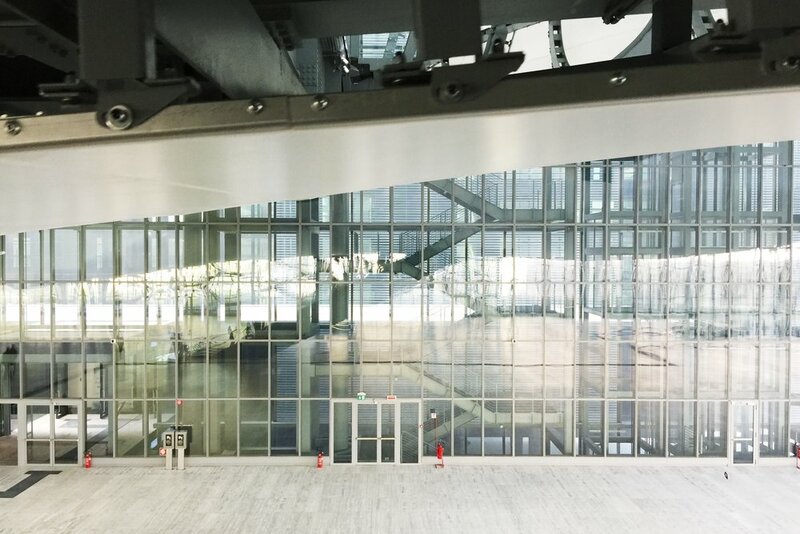 I've been that archi-stalker, visiting the construction in EUR as much as I can to get a glimpse inside the glass box. For a long time, years, all I could see was what looked like a metal carcass. And then one day this year, I read La Nuvola unveiled itself a Halloween inauguration. The congress hall/conference center of a new Rome was [almost but not quite] open for business. Ten years, I told myself. What's a few more months? And that's serendipity. 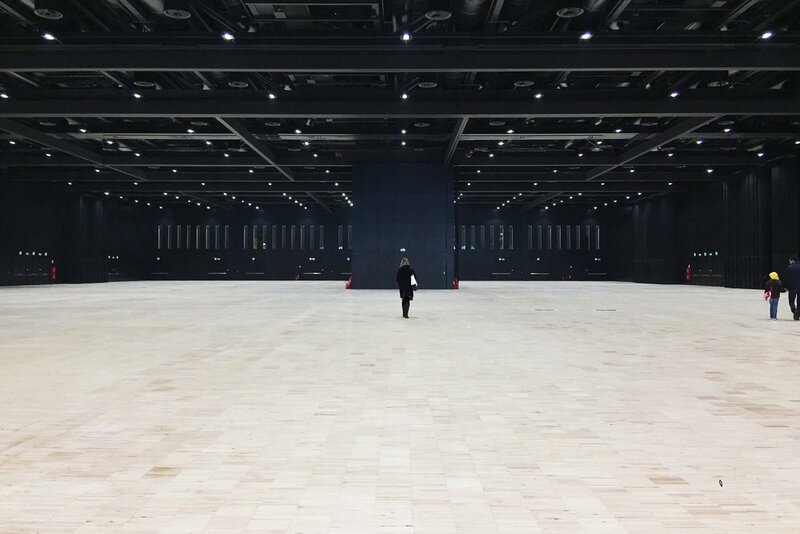 La Nuvola announced public visits, by reservation only, for four days during the second week of December. La Nuvola was ready for me. We head first to an underground, a rectangle black hole, or Kubrick's 201o in horizontal format. This is a monster of a congress hall designed to fit 3000 people, or be divided into smaller components for groups. My inner Spike Jonez wants me to shoot a video here, preferably with Christopher Walken. Up in the The Cloud, ground level. It's a diaphanous, amorphic shape, anchored to the floor. An Ikea paper lantern. Or a paper-machè Pikachu, waiting for lift off. It's gleeful. I am worried about the sun and heat in the summer months. How will it feel? Trapped? Will it wilt like all pretty things on a hot day? Will it run away like a naughty Pokemon? Inside the Cloud is a crazy, curvy metal skeleton that makes me think about Barbarella and ordering a black polyeurethane dress. I wish La Nuvola was a performing arts center because I'd really enjoy a long intermezzo tiptapping around on stilettos and with a cocktail in hand. And then I remember it's meant for large conferences and key note speakers. I make a mental note to sign up for a conference, any conference. Pop of color. The main conference room. It's like being inside a heart. I love the contrast from white to blood red. People in glass houses.... The Nuvola is contained in a glass box, that naggingly reminds me of Jennifer Lopez. I am thinking about The Cell, which means I am really thinking about Damien Hirst. No one else really like it as much as I did. I want to see people walking up and down the fire stairs. I want to have someone take hyperlaspe videos of me in a fluoro blue dress running up and down. I like transparency. My take? It's about time this Nuvola opens, and if I were you, I'd take a double look at any late 2017 conferences happening in Rome.